The Bowery Duffle is the perfect travel duffel. 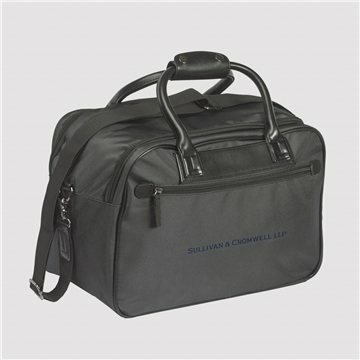 It is large enough to hold a trips worth of clothing and tech accessories, whether its business or pleasure. The full zip top opens the bag completely to easily access folded clothing and other items. The exterior is made of luxurious black pindot, while handles and trim are constructed of faux leather. The sturdy hardware and quality zippers make this a durable duffel bag.